1. A 78 year old male presents with the diagnosis of syncope. He was walking in his garden when he felt lightheaded and then collapsed. There are no injuries to find. His vitals are HR 48 bpm, BP 97/57. He is afebrile and mentating normally. He is admitted for monitoring. What is the diagnosis on the ECG? 2. 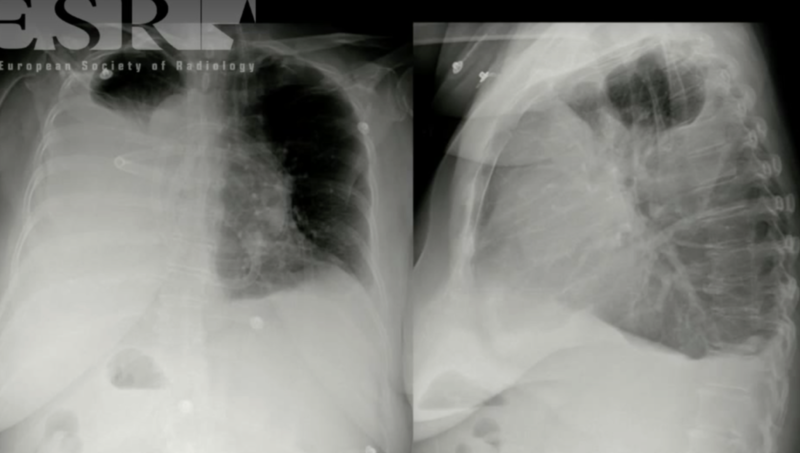 A 60 yo woman presents with increased shortness of breath. What does the Xray show? 3. A 45 year old woman presents with a swollen, red and painful forearm. Her recent past history is that she sustained a forearm fracture 6 weeks ago. Her plaster was removed a week ago. This morning she woke with a swollen, erythematous and painful forearm as in the photo. What is the diagnosis? 4. A 60 year old patient presents with palpitations and Shortness of breath for over one hour. He states that he has had SVT before. He is afebrile with BP of 118/62 and sats of 94% on room air. You perform an ECG. What is the diagnosis and why?